This recipe is one of my all time favourites! I don't get to have it very often as my partner isn't such a fan of fish, so when I get the opportunity I jump at the chance. 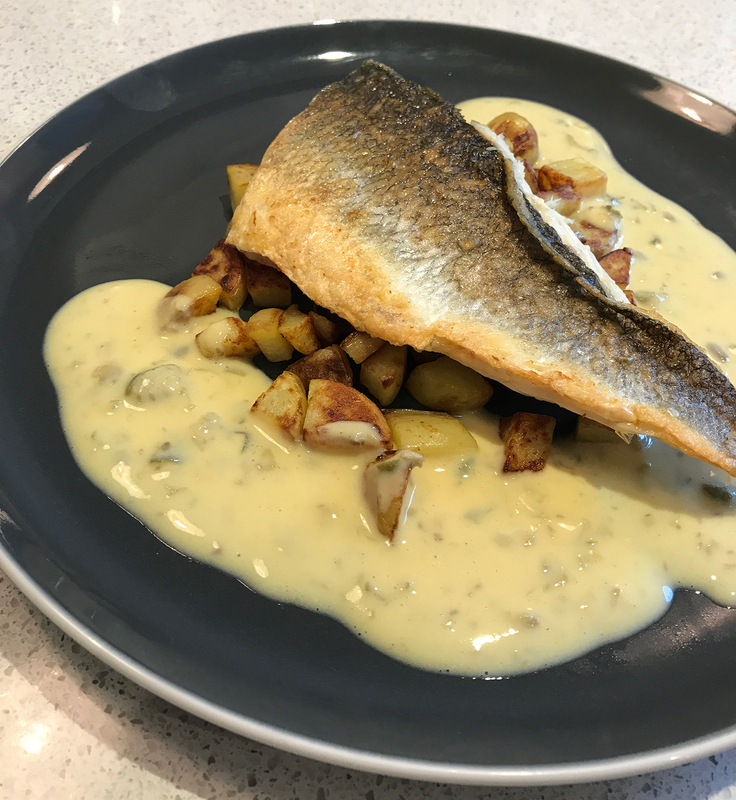 It's quick, tasty and the sauce that goes with the fish is creamy without the cream, offering a healthy alternative which tastes really good. Give it a try! Preheat your oven to 200°C (fan assisted). Quarter your new potatoes, coat them in 1tsp of rapeseed oil, season with salt and pepper, give them a good shake in an oven tray and place into the oven. These will take around 40 minutes to cook. Place a frying pan on a medium heat with the remaining rapeseed oil drizzled around the pan. I don’t like to cook the seabass too hot and char the skin, I like it nice and brown and crispy! As your oil is warming, place your egg yolks, lemon juice, and mustard in a bowl/jug and whisk until thick and a lovely yellow colour. By this time your oil should be warmed but not hot. Add your seabass, skin side down. You’ll want to cook this for about 4 minutes or so before turning. Leave well alone, you don’t need to move the fish around – let it do it’s thing. Now slowly add 200ml of the cooled vegetable stock to your egg mix, leaving 50ml aside for later. It’s important that it’s cooled as hot stock will begin to cook the eggs. Once combined, pour into a small pan over a medium/low heat and add the chopped capers. Continually stir with a whisk, letting the heat warm through the mixture and you’ll notice the sauce start to thicken. If you notice the sauce gets too thick, use your left over vegetable stock and begin to add some more to the mix while you stir. Season to taste. After 4-5 minutes cooking, and the skin should be nice and browned, it’s time to flip your sea bass. Cook for a further 1-2 minutes before removing from the pan. If you’re insure, pull apart a tiny bit of the thickest bit and it should flake apart and be lovely and moist. It’s important not to overcook your fish! To service, place your new potatoes in the middle of your plate, sit your sea bass on top, skin side up. Take your lovely sauce and pour around the edge avoiding coating the fish to keep the skin lovely and crisp. Serve up with your favourite greens and enjoy! Please comment if you try this recipe and let me know what you think!